Etosha has great concentrations of game, especially in the dry winter months, and there are wonderful views out onto the salt pans which dominate the center of the park. Etosha's only drawback is that the accommodation offered within the park is in the form of large, impersonal public rest camps. Ongava offers an excellent alternative. Ongava Lodge is situated on the private 66,000 hectare Ongava Game Reserve, which shares a common border with Etosha. The lodge offers the full Etosha experience while providing great accommodation and service, as well as the opportunity to take night drives and nature walks on the reserve, activities that are not allowed within Etosha. 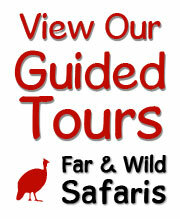 Ongava Lodge is operated by Wilderness Safaris. Ongava Lodge has 10 chalets which are attractively built out of brick and thatch close to the top of a hill. Each chalet has an en-suite bathroom with flush toilet, bath, shower and double hand basins. There is air conditioning in the rooms and overhead fans. The rooms have glass fronted doors which lead out onto a private covered verandah overlooking the bush. The main lounge, bar and dining area are also under thatch with wonderful views across the plains and to the floodlit waterhole below. Outdoor dining under the stars, whilst viewing game drinking at the waterhole is something never to be forgotten. There is also a swimming pool and a large curio shop, stocking a good selection of African gifts and branded safari clothing. As the lodge is built close to the top of a hill, there are several steps. If you can not climb steps, we suggest you book into Ongava Tented Camp. An additional two luxury suites were added during 2003. Etosha National Park is Namibia's premier game viewing destination. It is one of Africa's largest game parks, being nearly the size of Switzerland. Large herds of plains game concentrate around the waterhole's in the dry season making for exciting game viewing. Species that can be seen year round include Elephant, Lion, Leopard, Cheetah, Giraffe, Zebra, Wildebeest, Springbok, Oryx, Kudu and the diminutive Damara Dik-Dik. Birdlife is also good with Ostrich and raptors in abundance. Local specials include the Short-toed Rock Thrush, Hautlaub's Francolin, Rockrunner, Ruppell's Parrot, Whitetailed Shrike and Chesnut Weaver. A highlight of Ongava is that it is one of the few private game reserves in Southern Africa where guests have a chance of seeing both Black and White Rhino. For those who enjoy close wildlife encounters, tracking White Rhino on foot with an armed guide is a highlight not to be missed. Ongava Game reserve also has a good population of Lion, Eland, Hartmann's Mountain Zebra, Black-faced Impala and a number of other antelope species. Situated along the southern boundary of the Etosha National Park, close to the Anderssen Gate in northern Namibia. South of Okaukuejo. Located in its own private game reserve.